In addition to an indoor pool, Holiday Inn Guelph Hotel and Conference Centre provides a sauna and a 24-hour fitness center. The hotel offers a restaurant. A bar/lounge is on site where guests can unwind with a drink. A computer station is located on site and wired and wireless Internet access is complimentary. A 24-hour business center is on site at this 3-star property. Event facilities measuring 12000 square feet (1080 square meters) include a conference center. This family-friendly hotel also offers multilingual staff, a picnic area, and complimentary newspapers in the lobby. Onsite self parking is complimentary. Holiday Inn Guelph Hotel and Conference Centre has designated areas for smoking. This family-friendly Guelph hotel is located in the entertainment district, within 2 mi (3 km) of Stone Road Mall and University of Guelph. Macdonald Stewart Art Centre and Alumni Stadium are also within 2 mi (3 km). Along with a restaurant, this hotel has an indoor pool and a 24-hour fitness center. Free WiFi in public areas and free self parking are also provided. Additionally, a bar/lounge, a sauna, and a 24-hour business center are onsite. All 137 individually furnished rooms provide free WiFi, free wired Internet, and pillowtop beds. For a bit of entertainment, LED TVs come with cable channels, and guests can also appreciate conveniences like refrigerators and coffee makers. 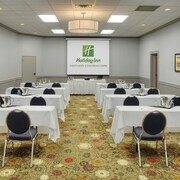 Holiday Inn Guelph Hotel and Conference Centre offers 137 air-conditioned accommodations with coffee/tea makers and complimentary weekday newspapers. Each accommodation is individually furnished. Pillowtop beds feature premium bedding. 43-inch LED televisions come with premium cable channels and pay movies. Bathrooms include shower/tub combinations, complimentary toiletries, and hair dryers. Guests can surf the web using the complimentary wired and wireless Internet access. Business-friendly amenities include desks and phones; free local calls are provided (restrictions may apply). Additionally, rooms include irons/ironing boards and blackout drapes/curtains. Housekeeping is provided daily. Elements on Stone - This restaurant specializes in American cuisine and serves breakfast, brunch, lunch, and dinner. Guests can enjoy drinks at the bar. A children's menu is available. Rollaway/extra beds are available for CAD 10.0 per night. Flights from Regina Intl. to Minneapolis St. Paul Intl. Flights from Regina Intl. to Winnipeg James Armstrong Richardson Intl. Flights from Thunder Bay Intl. to Edmonton Intl. Flights from Thunder Bay Intl. to Macdonald Cartier Intl. Flights from Grande Prairie AB to Kelowna Intl. Flights from Regina Intl. to Los Angeles Intl. Flights from Greater Sudbury to Pierre Elliott Trudeau Intl. Flights from Regina Intl. to Sky Harbor Intl. Flights from Regina Intl. to Victoria Intl. Flights from Greater Sudbury to Thunder Bay Intl.